Pair your Suunto Ambit3 Run with a Bluetooth® Smart compatible foot to receive additional information during exercise. The Suunto Smart Sensor included in your Suunto Ambit3 Run package (optional) is already paired. Pairing is required only if you want to use a different Bluetooth Smart compatible heart rate sensor. Pairing procedures may vary depending on the POD or heart rate (HR) sensor type. 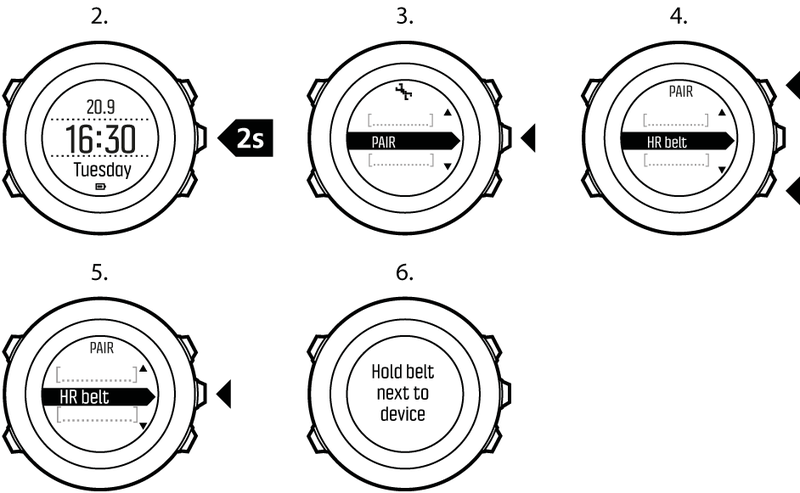 Please refer to the user guide for the device you are pairing with your Suunto Ambit3 Run before continuing. Hold your Suunto Ambit3 Run close to the device you are pairing and wait for Suunto Ambit3 Runto notify that pairing was successful. If the pairing fails, press Start Stop to retry, or Light Lock to return to the pairing setting.